Do you want to learn how to build your own haunted house and detail your attraction like the best in the industry? Our DVD collection will help you design and detail your haunted house into one of the best most detailed haunted houses in the country. Learn secrets of how to carve foam, create elaborate sets and even detail animations, and effects into your scenes. Do you want to learn decades worth of secrets to make your Halloween attractions as good as any Hollywood movie you've ever seen? You need all of these DVD's and below we are offering discounts when you purchase multiple DVD's. Detail your haunted house like the pros. The best educational experience you'll ever purchase. 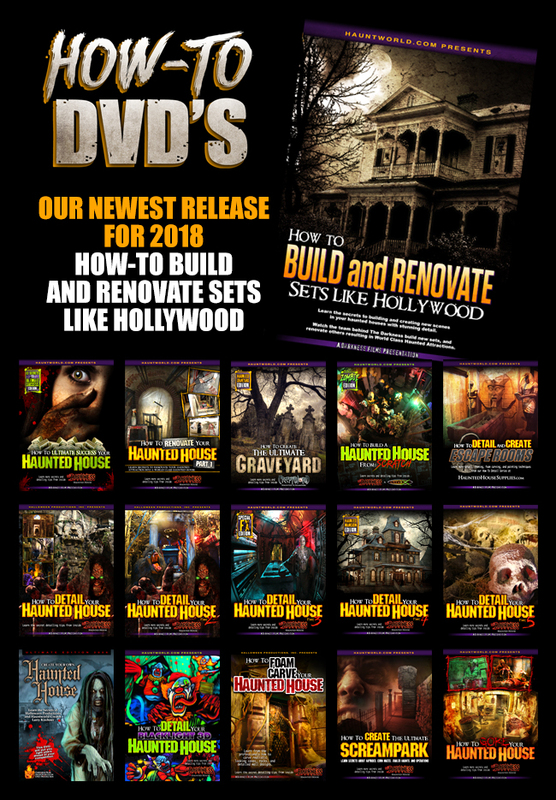 Each DVD has different and unique information to help you create your own ultimate haunted house. OR ENTER TITLES IN THE MESSAGES SECTION AT CHECKOUT.